An upcoming sales tax holiday is expected to offer Alabama shoppers savings on back-to-school supplies. The Alabama Department of Revenue says Alabama's sales tax holiday — when state taxes are dropped from certain items — is scheduled for the weekend of August 7-9. 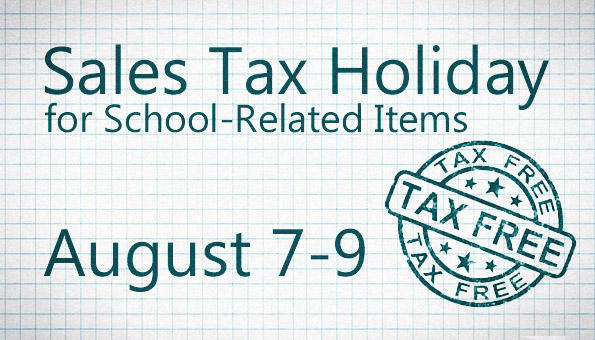 The holiday will exempt sales taxes from all clothing items priced at less than $100, computers and educational software worth less than $750, school supplies, books and more. Alabama Retail Association spokeswoman Nancy Dennis says consumers are expected to spend just more than $1 billion on back-to-school supplies this year and the tax holiday encourages more economic activity in the state as kids, parents and young adults get ready for another year of school. Alabama Department of Revenue officials say this will be the state's 10th sales tax holiday. Local sales taxes may still apply to some goods. People who sell alcohol and those who drink it are expected at two public hearings today. The Alabama Alcohol Beverages Study Commission will convene today in Huntsville and Hoover. Othni Lathram is the director of the Alabama Law Institute and chief of staff for the commission. He says he looks forward to hearing the public’s opinions and proposals. The hearings will focus on laws related to the manufacturing, distribution, sales and licensing of alcoholic beverages. The Southern Regional Conference for Learning in Retirement is going on this week. The event is being held at The University of Alabama by the Osher Lifelong Learning Institute. The OLLI organization specializes in providing mature adults with opportunities for intellectual stimulation, cultural development, and social interaction. Jennifer Anderson is the Director of OLLI at UA. She says OLLI is for the joy of learning. The conference will be held at the Bryant Conference Center at the University of Alabama. It runs from July 28-30 and will include lectures on how to improve various lifelong learning programs. The Birmingham Barons are clearing Regions Field of all peanuts for one night so fans with severe peanut allergies can attend a baseball game. Barons officials say they've partnered with the Alabama Allergy and Asthma Center to host Peanut-Free Night at the ballpark tomorrow night when they host the Mississippi Braves. Officials say no sunflower seeds or other foods containing nuts will be sold at or allowed inside the ballpark and all concessions items will be cooked in peanut-free oil. The Barons were recently on an eight-day road trip and officials say Regions Field received a thorough cleaning while the team was gone. The seats have been bleached and the cooking equipment has been washed to clear out any peanut residue and dust. Tomorrow night’s peanut-free game begins at 7:05 PM. Alabama Public Radio's morning newscast for July 27, 2015.